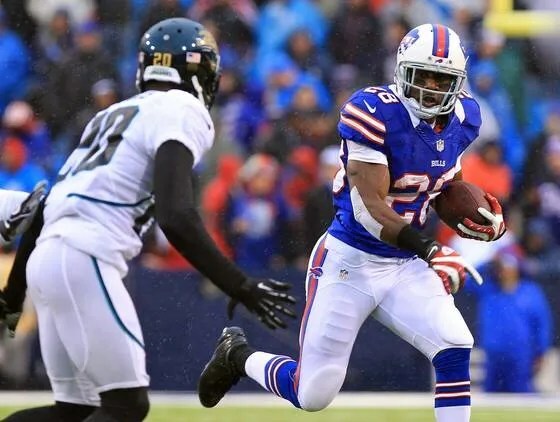 With their win on Sunday the Bills simultaneously stayed alive in the race for a playoff spot while remaining firmly entrenched in the AFC East race. Due to New England and Miami’s records entering the week and the victory by the Jets, the Bills didn’t experience any sort of change based on their placement in the standings. That leaves a number of teams to hurdle if the Bills expect to qualify for the playoffs. Just one more game until Bills fans can unite and begin to prognosticate and mull over the draft. One more game after Sunday’s loss in Miami. Buffalo’s loss to the Dolphins was about as meaningless as they come which is really only unfortunate in the sense that 2012 makes a baker’s dozen worth of seasons in which all four December games were dead air filling three hours on a Sunday afternoon. Sunday’s loss wasn’t all that different from most of the losses this season. The Dolphins enjoyed success with their ground game, managed to include an offensive wrinkle that baffled the Bills’ coaching staff and they forced Ryan Fizpatrick to try and make plays to change the game. This recipe can be found on page 13 of the “How to Beat Chan Gailey Cookbook” offered at retailers across the country. Trying to make heads or tails of another one of these losses is beyond pointless. Unlike some of the games earlier this season, Sunday’s defeat brought nothing new to the table. Mario Williams, Kyle Moore and Shawne Merriman were ineffective off the edge in what was truly the most unimpressive game from that trio in a few weeks (Seattle excluded due to the overall awfulness of the defense that day). The defensive tacks and secondary were also quite average for most of the game themselves. As for the linebackers, they might be better off seeing if the other team will play eight-on-eight rather than keep those three on the field. Now, it is important to realize that because Mario Williams did not have a three sacks and wasn’t a factor on each and every play of the game that he is not only horribly overpayed but an overrated and pampered talent that is going to drag this franchise to the ground. At least that is what Jerry Sullivan will lead you to believe. In fact, this lost season will fit nicely atop Super Mario’s mantle for no other reason than him being anointed as the player who would save the team and begin to drag the franchise from the depths of mediocrity this season. Count me among those who bought into the philosophy. The Bills hadn’t had a game changing defensive talent on the roster since Aaron Schobel was good six years ago. Williams was that player and more before he even put on a helmet and despite what Buffalo’s resident pessimistic jackass columnist will have you believe, he was that player. Williams is the first Bill to eclipse ten sacks since Schobel did it in the mid-2000s and is just on the outside of the league’s top-10 for sacks this season. What is going to be overlooked by many in Buffalo is that Williams play through the middle portion of the season was a catalyst for the Bills success. When he hasn’t played well, the defense hasn’t played well. But when he is making plays and wreaking havoc, the Bills are a better team. At the end of the day that is exactly what he was signed to do. Go ahead and beat your drum about his contract and being overpaid. You might as well hitch that wagon to the Ryan Miller horse while you’re at it. While many arguments about Williams and his play have validity, most of this white noise just shows how ill-prepared Buffalo is to have a true superstar. Whether it be Miller or Williams (or any future big name that is signed here), Buffalo fans (and some media members) seem to live under the misguided pretense that this player is to be a god-like figure who will singlehandedly carry his respective team to glory. Most of the time it just leads to whiner line calls and columns referring to fridges and other nonsense but sometimes there are intelligent people having intelligent conversations. While I might not be the brightest bulb, I can certainly see what Williams was able to contribute to an otherwise pitiful defense. While plenty of press will revolve around the shortcomings of the coach, quarterback and defensive unit, I wonder why Marcell Dareus hasn’t received more scrutiny. Dareus has had a very difficult year and I commend him for being strong in the face of the tragedy he has faced. What I certainly don’t know is how it has affected his play and I wouldn’t dare speculate to that degree. What I do wonder is how things may have differed if the Bills had landed Von Miller in that draft. While Cam Newton was the assumed #1 pick, Miller and Dareus certainly could have switched places. Would Miller have brought more to the defense? Was Dareus a consolation prize for the Bills at #3? Or is this just another instance of “Buffalo Sports Luck” and the team finding the lone bust in a rich top-five? I don’t hate Dareus as a player and I think he can be a difference maker, he shows as much at times in each game. However, he doesn’t seem to have the same motor as Kyle Williams. Perhaps Dareus is a little overweight and isn’t capable of playing as the dominant force he was at Alabama. 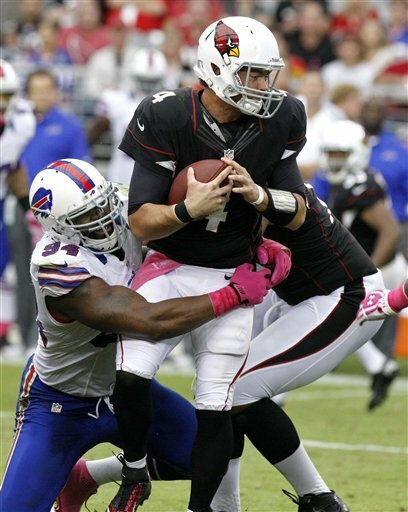 I’d like Dareus to come back in 2013 after dropping about 20 pounds and committing to a more nimble and agile game. The play of the linebacking corps has been the Achilles heel of this Buffalo defense. Kelvin Shepard was drafted as a 3-4 inside linebacker and hasn’t done much to prove his worth in a 4-3. Nick Barnett has been capable as a three-down player but is clearly an aging commodity. As for Nigel Bradham? He has been average at best and hasn’t done much to appear to be improving as the year has progressed. He may have the most upside of the three and that is a scary thought. None of the three were visible difference makers on Sunday and that has been a near weekly occurrence this season. Linebacker may be the biggest need for the Bills and could most definitely be in the cards when they come to pick in the first round. MVP: CJ Spiller has continued to build on his impressive breakout campaign. Good for him for showing how effective he can be with more than 20 carries. LVP: Passing offense. For a coach who showed so much creativity early last season, his approach and offensive play calling has been horrendous as of late and the inability of the offense to move the ball without CJ Spiller was appalling. It was over when Reggie Bush scored his third touchdown of the game. Based on the way the passing offense was working, the Bills weren’t coming back from that deficit. The Bills confirmed much of what the fanbase already knew on Sunday, they’re better than the worst teams in the NFL. The team moved to 5-6, still well outside the playoff and top-five draft pick niche that the team has carved for most of the past 12 years. What following the Bills has become is little more than a rotation of broken records. You can change the tune and rhythm, but it is always the same song over and over again. Poking the bear one too many times led to the Bills getting bit. The bear in this case was questionable play calling. For the second-straight week, Chan Gailey was rolling the dice late in a game the Bills held a lead in. Unlike last week against Arizona, the opponent came away with a victory after the Bills failed to milk the clock and secure their lead. One thing that the past dozen years has taught Bills fans is that there is always a new way to lose a game. Sunday almost became the most recent as an ill-advised wildcat pass, 61-yard field goal and a subsequent chip shot almost did the Bills in. However, the Bills survived and escaped Arizona with a win, in spite of themselves. Thus far, the 2012 season has been maddening for most fans. The team has turned in varying performances which haven’t been consistent from week to week. In fact, the most consistent performance turned in this year was by the defense in back-to-back gashings against New England and San Francisco. However, Sunday was the opposite. The defense was stout in collecting a handful of sacks and limiting the Cardinals offense to a limited array of success on only a few plays. Not only was the run game adequate, but the pass rush was downright dominant. For the first time this season, there wasn’t a soul in Bills Nation who could kick any sand on the defensive line. The defensive performance was not only refreshing following two-straight losses, but it was necessary on a day in which the offense wasn’t up to the challenge of putting their foot on the collective throats of the Cardinals. Offensively, Ryan Fitzpatrick continued to dig his grave with the fans and probably has begun to dig one with the coaching staff as well. The fans, who were exasperated after the collapse against the Jets and Patriots, were ready to run him out-of-town after every poorly thrown pass on Sunday. It doesn’t seem as if Chan Gailey is necessarily ready for that just yet as he continued to call pass plays despite the obvious inability of his quarterback to do any damage through the air. However, the decision to try to milk the clock after a first down sack late in the fourth and the design of many of the late passing plays does point to a more conservative play calling approach which may be trending away from the glaring weakness that is Fitzpatrick’s arm strength. That playcalling, however, just about sealed the Bills fate on the afternoon. After a baffling decision to throw a deep ball out of the wildcat formation, Gailey continued to force passing plays despite his running game’s obvious dominance on most downs. Alex Carrington’s fingertip deflection of AJ Feely’s game winning field goal attempt kept the Bills above water and Jarius Byrd’s second interception gave the Bills the win. Without those two big plays and the continued success of the pass rush, the Cardinals probably would have come away with a victory. Ryan Fitzpatrick is not Jim Kelly, that much was assumed a long time ago. However, any doubters were likely converted while watching Fitzpatrick direct the Bills first-team offense last night against Washington. Fitzpatrick trotted out with a number of open and spread looks in the brief time he and the starters saw last night. It was indicated that he was the one calling the plays while reading what the defense was giving him. The result was zero running plays and three points. There were flashes of brilliance from the starters and there is the obvious fact that the gameplan last night doesn’t even represent a quarter of what the Bills will present in the regular season. So anyone who has proclaimed the sky is falling regarding the offense, team and season; take a step back.